Ginger Hollow is the name of 15 acres of eastern Wisconsin rural land. 11 acres of it is heavily wooded wetland. The remaining has several acres of mixed prairie, re-growth of ash, willow, linden, various shrub species, organic gardens and our family home. Located 3 miles inland from Lake Michigan the hardiness range here is Zone 4-5. For safety sake perennials planted here need to be hardy to –30degrees F. Many trees, shrubs and perennials planted that were supposed to be Zone 5 hardy (-15 to-20F) have died out after a severe winter. The material on this website is largely my own, a 65 year old mother and grandmother. I’ve lived here at Ginger Hollow since late 1974, working with the goal of organic management, and more recently, the principles of sustainability and self-sufficiency. These goals have only been partially reached but this is where I am heading. This website will share the journey, the successes, the effort and what didn’t work. I thank my children, their spouses, companions, and my grandchildren, for all the help given over the years. They keep me inspired in this labor of love. – To encourage people who are new to gardening or rural property to get involved with whatever land you have access to, now. – To share gardening ideas that consider the physical abilities of the elderly, disabled, and very young. – To promote the wonder and life enhancing power of working and being among the growing things. Here, in the cool shade and rich soil of this woodland, grow patches of Wild Ginger, a favorite food of white tail deer and a herb of interest to people as well. The attractive plant grows by runners along the surface of the ground with short roots spaced every few inches to anchor it. Found in dense patches the runners often cross over each other. Leaves shaped like inverted valentines rise in sets of two along the runners. In spring a small goblet shaped flower appears between the sets of two stems at ground level. The leaves and new flower look like tiny new families with a bouncing babe. The flower sports three points on its lip, shaded purple or rusty brown. This lovely native Wild Ginger has velvet leaves here but is found in Canada with glossy leaves. When cut, the runner has a fresh, moist ginger root aroma. Dried it is a bit spicier. The populations of our native species have dwindled, likely from heavy feeding by wildlife, though it is also used in the aroma industry. Ancient use was as an infusion for tea to address stomach complaints, and as a food seasoning. 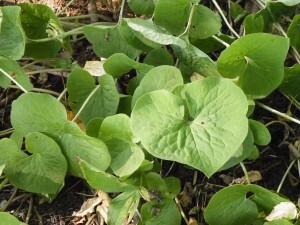 It is very difficult to establish plantings of Wild Ginger outside of woodland areas as it requires moist rich soil and shade. The summer of 2009 our wetland woods experienced severe drought. Though the soil was dry, hard and suffered deep cracks the Wild Ginger survived, though the leaves were drooped over and the roots beginning to wrinkle from lack of moisture. Copyright © 2019 Ginger Hollow - All Rights Reserved | Contact Us. Site by Rational Design Studio.